For more than 20 years now, and the release of the first opus of the series in 1997, Harry Potter and the Philosopher’s Stone, the books have become hugely popular all around the world. Translated in 68 different languages,J.K. Rowling has sold more than 450 Million copies of the seven books so far. In 2016 author J.K. Rowling released the eighth Harry Potter story, Harry Potter and the Cursed Child, which topped the charts as the bestselling book of the year. There is no doubt J. K. Rowling’s Harry Potter has become a real phenomenon, an entire generation of both children and adults has become huge fans. The commercial success of Harry Potter is not limited to the book sale. Harry Potter merchandising is huge. The brand has teamed up with licensees on everything from Harry Potter wands to animatronics. There are Harry Potter theme park, Wizarding World theme park attractions. You can watch the Harry Potter movies while eating Harry Potter Jelly Bean and drinking Harry Potter Butter Beer Soda, dress up with your Harry Potter Hooded Bathrobe. But today, what I want to speak about is games, Harry Potter board games. Harry Potter: Hogwarts Battle is a cooperative deck building game. It is made for 2 to 4 players and takes between 30 minutes and 60 minutes (could take more) , depending on which game you’re playing. In the game, players take on the role of a Hogwarts student: Harry, Ron, Hermione or Neville, each with their own personal deck of cards that’s used to acquire Resources. Harry Potter: Hogwarts Battle is a fantastic introduction to cooperative games and deck building for new gamers. If there are Harry Potter fans in your family, I highly recommend you give that game a try. My kids are huge Harry Potter fans, and they absolutely love that game. It is one of our best family board games at the moment. Pressman PRS4330-06, Harry Potter Magical Beasts Game, Multicolor, 5"
Every body know Trivial Pursuit. Now the Harry Potter fans will be able to test their knowledge of the beloved Harry Potter movies with this version of trivial pursuit: World of Harry Potter. This quick-play Trivial Pursuit game can be played on-the-go with its portable wedge holder. Great game for traveling, to take with you to occupy your kids during a car trip for instance. If you answer correctly two questions in a row, you can keep a card.To win the game you need to collect six cards. There are 600 questions in the game. They range in difficulty levels. A lot of the questions are easy but there are a few challenging ones in the mix, so even the expert wizards will be challenged! Note that the questions are based on the Harry Potter movies rather than the books.Of course if you only have read the books, you will still be able to answer the question but if something differentiates between the film and book, you must answer based on the films. Might be a good reason the watch the Harry Potter movies again and pay more attention! Six trivia categories include: The Dark Arts, HOGWARTS, Magical Spells & Potions, Magical Objects, Magical People and Animals & Magical Creatures. Trivial pursuit: World of Harry Potter is a fun game for any Harry potter fan. This LEGO Harry Potter Hogwarts Board Game is designed to enchant Harry Potter fans of all ages. The exciting thing about this Harry Potter board game is that you get to build the board game yourself.Why? because it is a board game made of Lego! So if you are a Harry Potter fan and a Lego fan, guess what? this game is for you. Once the Harry Potter Potter Board game is built, players get to choose their Hogwarts Houses and the microfigure going with it: Gryffindor, Hufflepuff, Ravenclaw or..Slytherin. The objective of this Lego Harry Potter Board game get your microfigure to all the classrooms and complete all the homework (by collecting four items from four different classrooms) and then return to your Hogwarts House with those items.The classroom include Divination (in the tower), the library, transfiguration and potions. But LEGO Harry Potter Hogwarts Board Game is not quite as straightforward as it may sound: players must also contend with all sorts of magical obstacles! Since the game board is fully customizable, you can strategically rearrange the rooms to throw your opponents off course. In this way, the game encourages kids to think creatively, as they develop strategies to slow down their opponents. If you’re looking for a game that the entire family can enjoy, the LEGO Harry Potter Board Game is an ideal choice. It is simple enough for young children to enjoy, but is also deep enough to engage older kids and even adults. Includes content from all Harry Potter movies, including fantastic beasts! In Clue Harry Potter Board Game, a fellow student has disappeared from Hogwarts famous school of Witchcraft, and Dumbledore has ask Harry Potter to be on the case. This version of the classic Who has done it Clue board game, with its unique game play, will be a delight for the amateur of Clue Board games and Harry Potter Fan. In this Clue Harry Potter Board game, the players will be investigating the disappearance of a student rather than a murder. They will be playing as Harry, Ron, Hermione, Ginny, Luna or Neville and will be rolling the dice moving from room to room trying to solve the case. The twist here is that there is a special Hogwarts dice that will either make you draw a help card or allow you to move some wheels on the board and reveal secret passages, moving staircases, blocking doors or even revealing a Dark Mark. If you do reveal a Dark Mark when turning the wheel, you can protect yourself with a help card or pay up by losing house points. But beware as if you run out of house points, you are out of the game. And if all players run out of house point, this means victory for Lord Voldemort. When a player has made up is choice and is confident he has uncover the mystery, he can make is way to Dumbledore office before the other players to make your accusation. This Clue Harry Potter Board Game is fantastic version of Clue that Harry Potter fans will love. It takes the best parts of the classic game of Clue and merge it with some innovative game play, like the wheel that change the board game or the threat of loosing house points, that will keep the game interesting. Pictopia: Harry Potter Edition is a great team family board game for 2 to 6 players, age 7 and plus. This Harry Potter board game will take between 20 and 40 minutes to play. If you are an Harry Potter fan, this will be the perfect board game to demonstrate your knowledge of J.K Rowling’s wizarding world to your friend and family. The fact that this Harry Potter Trivia game plays in teams, will allow players with a little bit less knowledge about the Harry Potter world, to join the game and also enjoy themselves. But don’t worry, for those players that are not so keen about the Fantastic Beasts, you can put aside the 10 or so questions related to that particular movie and keep playing only with the questions on the Harry Potter movies. Whether you’re called to answer together or alone, you’ll wager every time based on your knowledge of the images on the cards! Reveal how much you know about other players with guess-my-answer questions! So go ahead, can you guess which player would make the best Triwizard champion, or which player would be most likely to accidentally break their wand. In Pictopia: Harry Potter Edition ,the instructions are very well written, the cards are well made and the images are colorful and sharp. Pictopia: Harry Potter Edition is a great Harry Potter Board game, definitely worth the try!! Harry Potter Triwizard Maze Game is an Harry Potter board game for 2 to 4 players aged 5 and up. Muggles and wizards alike will be enchanted by this magical game! It features fast-action Pop ‘N’ Race play as you race around the Triwizard hedge maze to capture the Triwizard Cup! Be careful – action spaces cause you to draw a card that can help or hurt your chances. Players pop the die and move their playing pieces around the maze, racing to reach home. Land on a ‘draw’ space to draw a Maze Card. Will you find a spell to send your opponent to another space on the board, or will a wind gust reveal a shortcut in your path? Cards can help, or hurt, your race through the maze, adding increased excitement and anticipation to the game. The first player to get all of his/her movers home is the winner and the Harry Potter Triwizard Maze Game champion! In Harry Potter Magical Beasts, players will explore the interior of Hogwarts in search of magical beasts. Each player will play the part of an Harry Potter character, Ron Weasley, Hermione Granger or Ginny Weasley in a race to capture one of six magical beasts.You will collect clues to track down creatures inside and outside Hogwarts. The goal of this Harry Potter board game is for the players to get four cards corresponding to one beast. This Harry Potter game is basically a roll and move game.It means that each turn, a player will roll the dice and the number on the dice will be the number of space he will move his character on the board. When a player lands on a tile that indicates a type of a card (Color, Size, Location or M.O.M (Ministry Of Magic) ), they can draw one card from that pile. The card is then placed facedown. If you get another card of that type, you will place the new card on top of the other card. The dice is a normal dice but instead of the 1, the side is showing a “P”. When the “P” is rolled, the player who rolled it, gets to go to a passage (location space marked with a “P”) of his/her choice. All other players not on a “P” are temporarily removed. The game board then shifts and the player who rolled the “P” are able to put the other players on any tile of his/her choosing and can steal one of their cards. The winner is the player who gets all four cards of each type for one magical beasts first. I would commend Harry Potter Magical Beasts if you want to play a simple game with younger kids. It is a pretty simple roll and move game, so this Harry Potter board game is purely based on luck so not so much strategy in this game. Fun for younger kids. I know what you are thinking about. Playing cards can not be considered as an Harry Potter Board game. But I just love playing cards with my family and I though those Harry P0tter playing cards look pretty cool! So there you go, I just wanted to share those with you those Harry Potter cards. There are just normal playing cards and you will be able to play your favorites card games with them. 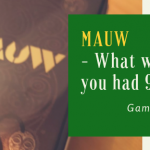 Mauw - what would you do if you had 9 lives?